10% off parts and service not to be combined with any other discounts or offers. Fleet pricing on vehicle purchases. Contact Ronnie Pimentel. 10% Discount! Be sure to say Discount Number “32D1892” Pin: “LON” For more information, call 1-800-RENTACAR. 10% discount on application, database, network service and supported technical staffing needs. Call Terry for more information. 15% off hourly rate on all services – IT Infrastructure, Managed Services, Monitoring, Help desk, Application & Web Development. We are a full service IT consulting firm, providing premier support to customers since 1998. Based in Long Beach, we are offering this discount to all Chamber members. Join LBS Financial and they will pay the one-time Membership Fee and fund the first $5 of your savings*! Just apply online or visit any branch and open a Free Checking with eStatements account or Interest Checking account and use Promo Code: LBChamber. *$1 Membership fee and $5 initial savings deposit must be made when opening the account online. LBS Financial will credit the $6 back into your new savings account within 30 days of account opening. New Members only. We are here to service YOU!! THANK YOU for choosing Polished Rx Skin Couture! We LOVE What We Do! 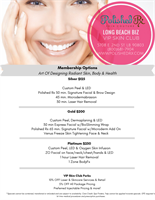 Polished Rx Skin Couture & Up Creative Inc.
Business VIP Skin Club at Polished Rx Skin Couture is now LIVE! Local Business Owners, WBC & Long Beach Chamber members can now save up to 25% OFF select services in our new membership program!! As business owners/managers, we need some self-care too! *Specials cannot be combined, transferred or refunded and are subject to availability. Care Credit, Spa Finders and Yelp Vouchers cannot be used towards special offers. GFE required prior to all medical services and prescription product purchases. Chamber members will receive 10% off their bill when presenting their loyalty card. Chamber members will receive 15% off their bill when presenting their loyalty card. 30% Off Rack Rate (Based on Availability). Includes Free Deluxe Continental Breakfast. Contact John Wu for more information. Long Beach's latest boutique hotel would like to extend a special 50% off rack rate to Chamber members. Includes continental breakfast buffet. Additionally 50% off all spa rooms as well. AdminExcel 20% off per employee license fee. Free Demo CD. $25 initial service discount. For more information call (562) 428-8894. Spitting Image Photo Booths is pleased to offer all Long Beach chamber members a 10% discount on all of our photo booth packages and services. 10% discount on all printing services. Contact Hilda Sanchez for more information. Chamber members will receive 20% off their bill when presenting their loyalty card. CSULB - Associated Students, Inc.
Community Education classes – 10% discount to Chamber members on selected classes, seminars and workshops. For additional information, go to http://econdev.lbcc.edu/communityed or contact Carina Serrano @ (562) 938-5051. 10% Tuition Discount + More! Save 15% off supplies with your Smart Phone. For more information contact Doug at the number listed below.